Kepicenter | The official blog of Kepi Software, covering topics such as Cocoa, programming, and happenings in the Mac dev world. Since I started programming, I’ve become increasingly interested in attending Apple’s Worldwide Developers Conference. Unfortunately, the cost for attending—specifically, conference access and the hotel stay combined with airfare from Canada—has always been high enough that it wasn’t a justifiable option for someone that was coding in their spare time (i.e. just for fun, not so much for profit). My employer has room in the budget to send some of us Systems folk to a conference each year, and I had been discussing with my boss which one would be a good fit this go around. For the past two years I’ve gone to the FileMaker Developers Conference as I’ve been doing full-time FileMaker development at work during that time period. This year I’m the lead developer on the project to build the web front end to that database, and the amount of benefit I’ll get from DevCon this year isn’t nearly as significant as it has been. My boss asked if there was another conference I’d rather go to that would be more beneficial. In the end, the one at the top of my list wasn’t the most directly applicable to my job (it was far from being completely irrelevant, though). I even mentioned it initially only as an off-hand remark along the lines of “Boy, I’d love to go to this one, but…”. Early last week she came into my office and said that I could go. This year’s WWDC runs June 9-13 in its usual stomping ground of San Francisco. The flights are booked, hotel reservations made, and WWDC E-ticket activated. 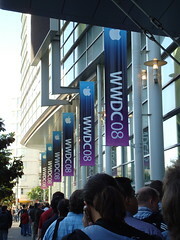 Scott Stevenson posted a great article back in 2005 aimed at helping attendees get a grip on what to expect and how to get the most out of WWDC. Since then, there have been a number of similar posts that I’ve also read over, though they tend to say roughly the same things as Scott. Not only my first WWDC, but my first Stevenote, too! Finally, I’ll get to experience standing in line for hours, only to then go stand in another line, and possibly another, all to bask in the RDF. Frankly, I’m not too concerned with getting good seats, so long as I can make it into the hall. I’ll just watch the stream later if there are things I want a closer look at. I’m in it for the experience. I’ve read some mixed reviews regarding the quality of the food provided to attendees of WWDC. It will be interesting to see, as someone who has attended a conference put on by an Apple subsidiary, how WWDC will compare to the wide range of quality food selections provided at FileMaker DevCon. Worst case, I hit up one of the dozens of eateries in the general vicinity of Moscone that people seem to rave about online. I’ve already received a personal recommendation to check out Eddie Rickenbacker’s. Any other favourite haunts I should make an effort to check out? As previously noted, this will not be my first time at a developer conference. It will, however, be my first time at one of this scale. FileMaker DevCon typically has an attendance of around 1,400 to 1,600, if I recall my figures correctly; WWDC 2007 had over 5,000 registered developers according to Steve Jobs’ keynote. Add to that the potential for a massive increase in attendees this year due to the influx of people interested in jumping on the iPhone development bandwagon, and it should be nice and cozy in Moscone. Having said that, what I need to keep in mind is while there will be many times more people at WWDC than FileMaker DevCon, Moscone West is also many times larger than the conference center of the J.W. Marriott Grande Lakes, where the latter event has been held these last two years. My long-held desire for wanting to attend WWDC is split about 50/50 between gleaning as much information as I could about developing for the Mac platform, and hanging out with other developers. 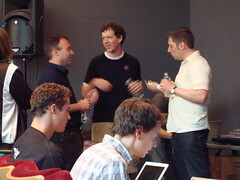 I’m signed up to attend Buzz Andersen‘s 5th Annual WWDC Party and have another developer meet up in the works. I hope to at least get to say hello and introduce myself to a bunch of the developers I’ve come to “know” through the MacSB and cocoa-dev lists, various and sundry blogs, and most recently, Twitter. To be clear, I don’t just view this as a chance to hang out and relax at a conference. I’m heading to San Francisco in June because my boss feels it will be beneficial to me as an employee first, and as an independent developer second. This will be a business trip. The bonus of the situation is that the information I take in will be equally applicable to my coding for Kepi Software as for potential future projects at work, so it’s win-win. Plus, when the sessions are over for the day, I’m off the clock so the options for what I do with my time are wide open! Yes, please. And as Daniel Jalkut put it, “…most people at the conference won’t know me when they see me”. You can study my ugly mug in my Twitter profile image. See you all there! Good day and good greetings! My name is Jeff Nouwen and I’d like to welcome you to Kepicenter, the official blog of Kepi Software. I always enjoy reading background information on other developers. It can be illuminating and sometimes just downright interesting. So without further ado, here’s some information about me. Note: no guarantees are made as to the interestingness of the following! I’ve been using Apple products almost my entire life. From plugging away on an Apple ][+ for typing class in third grade, to the first Mac my family owned, an LC II with a 14″ monitor (which was reasonably large back in 1992). The current setup includes my primary development machine, a Mac Pro (Early 2008) 3.0GHz 8-core with dual Dell 24″ displays. I’m also an avid collector of Apple hardware. Currently, I’m in possession of over 40 items, with some of the more esoteric specimens including a Macintosh Portable replete with carrying case and all original documentation; a QuickTake 150 digital camera; and a Newton MessagePad 130, all in excellent working order. I started programming in the mid-90’s when I picked up a copy Dave Mark’s fantastic Learn C on the Macintosh. I went on to graduate from the University of Alberta with a Computing Science degree (minor in Business). Programming is a true passion of mine; I love having the ability to create something out of nothing, especially when that something can help make peoples’ lives more productive or enjoyable. I’ve written code for System 7.1 through Mac OS X 10.5 and used everything from the Mac Toolbox, to Carbon, and now Cocoa. Kepi Software is the d/b/a for software I develop. As some may be aware, a kepi is a type of hat. It’s also tourist Hawaiian for Jeff. In actuality, Jeff is Iepi and Jeffrey is Kepeli. I guess those in charge of making “your name in Hawaiian” souvenirs decided Kepi rolled off the tongue better. Kepi Software seemed like a good name (and sounded far less silly than Jeff Software) so it’s what was chosen. There has been a web presence since 2000, but nothing much has been done on the Kepi Software front over the last eight years, half of which were spent earning my degree, the other half at my day job where I am a PHP developer. So what’s in store for Kepi Software? I’m hard at work on our first commercial product, but it’s still in the early development stage so further information will have to wait until a later date. What will start off as an endeavour nurtured during my spare time will hopefully one day blossom into a µISV like Red Sweater Software, Flying Meat, No Thirst Software, and Clickable Bliss. As for this blog, like the description in the header says, it will be another voice discussing Cocoa, programming, and other goings on in the Mac software development world. Watch for my next post which will talk about something that’s on a lot of Mac and iPhone developers’ minds right now: WWDC 2008.